It's not yet Halloween, but it's starting to feel like Christmas in the Rockies as snow is moving through Colorado, western Kansas and parts of northern New Mexico on Sunday. 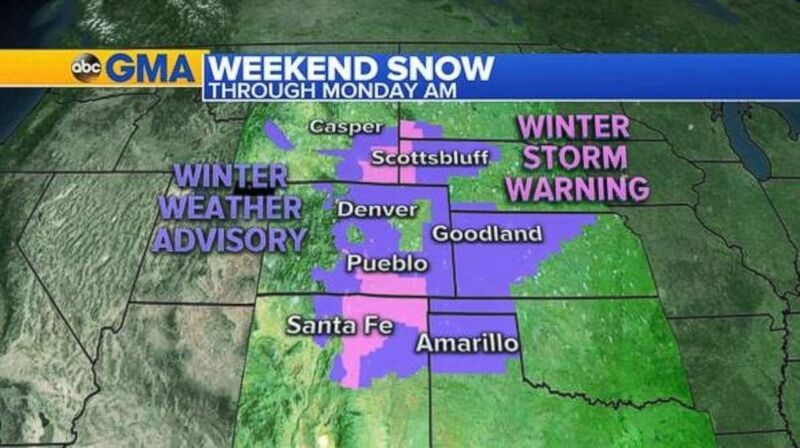 Winter weather advisories and winter storm warnings span across eight states through early Monday in anticipation of potentially heavy snowfall and blowing snow. Snow is falling across parts of the Rockies and Plains on Sunday morning. The snow is being caused by a strong cold front that will eventually reach as far south as the Gulf states by Tuesday. Winter weather advisories and winter storm warnings are in place for eight states on Sunday. Portions of the Texas Panhandle will challenge their daily records for coldest temperatures on Monday morning. Generally, 2 to 4 inches of snow can be expected across portions of Colorado, Nebraska, Kansas, and New Mexico through Monday. The highest accumulations will be seen at the higher altitudes. The Sangre de Cristo Mountains, the Wet Mountains and the summit of Pikes Peak in Colorado could see up to 16 inches of snow. Gusty winds could cause blowing snow and reduced visibility. 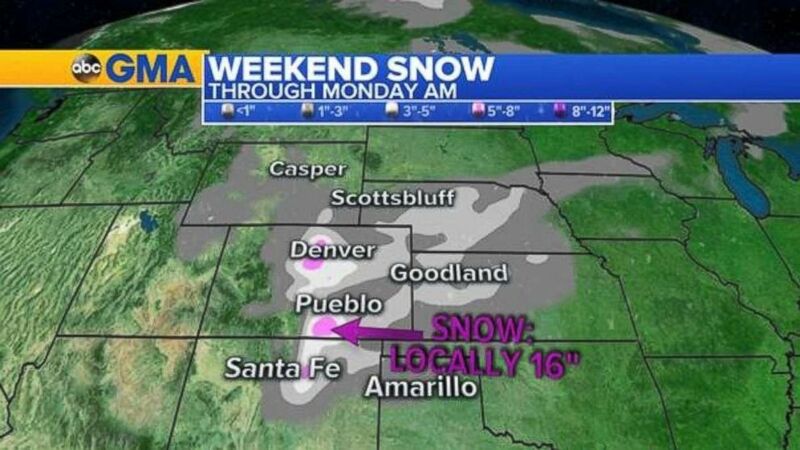 Over a foot of snow is possible in isolated locations in southern Colorado. Heavy rain is falling across parts of eastern Texas Sunday morning as the remnant moisture from Hurricane Sergio crosses through the state. As a cold front pushes south over the next few days, it will drive additional rain across the Southern Plains into the Lower Mississippi Valley. 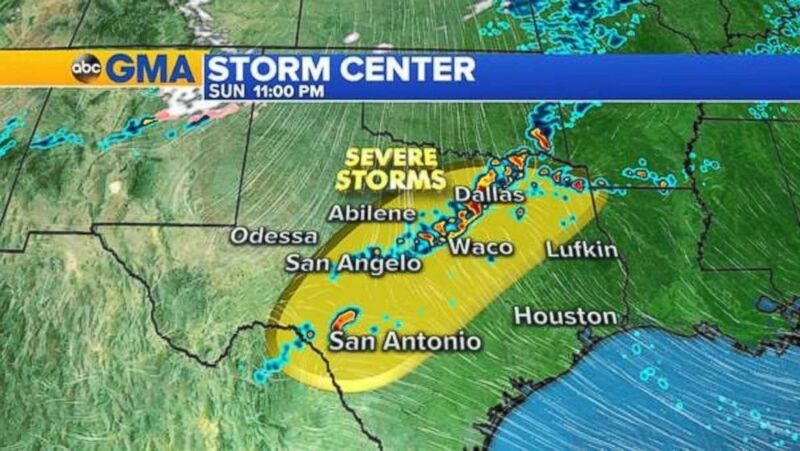 Severe storms are expected to move through central Texas on Sunday night. The Storm Prediction Center has issued a slight risk for severe weather Sunday evening into the overnight. Hail and gusty winds are the primary threats in the highlighted region, however, a tornado or two cannot be ruled out. Abundant moisture will cause rainfall rates to reach 1/2 to 1 inch per hour at times. This could potentially trigger flash flooding across central Texas on Sunday and Monday with the highest rainfall totals exceeding 4 inches over the two-day period. 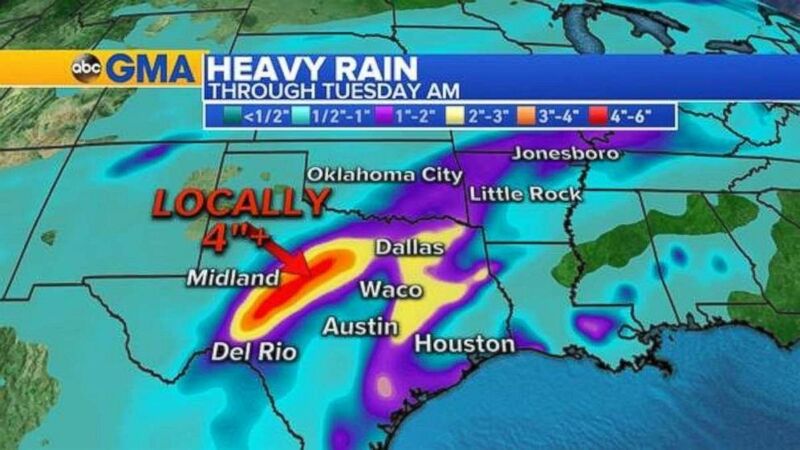 Heavy rain is expected over the next two days in Texas.